When you're in college, you want and need as much sleep as you can get. In order to get that sleep, you may find yourself cutting time from your morning routine. When you're cutting time from your morning routine, you need to have your dorm accessories easily accessible and organized. You don't want to hunt in different areas of your college dorm room for the perfect necklace or bracelet to complete your outfit. Keep your jewelry organized in one area with our Compact Jewelry Folding Organizer in Purple. 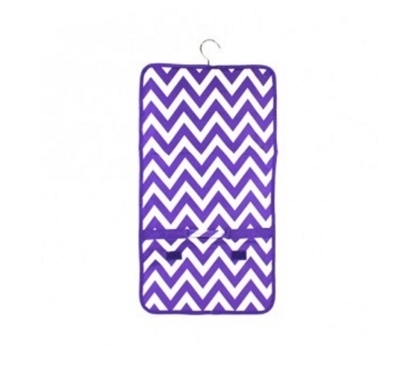 Our Compact Jewelry Folding Organizer in Purple has 28 zippered pockets to keep your jewelry organized. The pockets are even clear so you can see in the pockets for the exact dorm accessory you are looking for. Of course, safety is also a concern in college when you have valuable jewelry. This dorm essentials item has a hook so you can hang it up in your college closet and conceal it among your clothes so you only you know it's there. Going to visit your family for a weekend trip and want to bring your jewelry with you? Our Compact Jewelry Folding Organizer in Purple has Velcro straps so you can securely roll up this dorm organizer and take it with you.